I read the book by Stephen King (before the original movie came out in 1976) and saw all the movies. Loved each and every one, including the newest release, “Carrie.” I saw it last night and was major impressed. Sometimes we purists don’t like our originals to be tainted, but with modern twists it’s proven that you can perfect perfection. 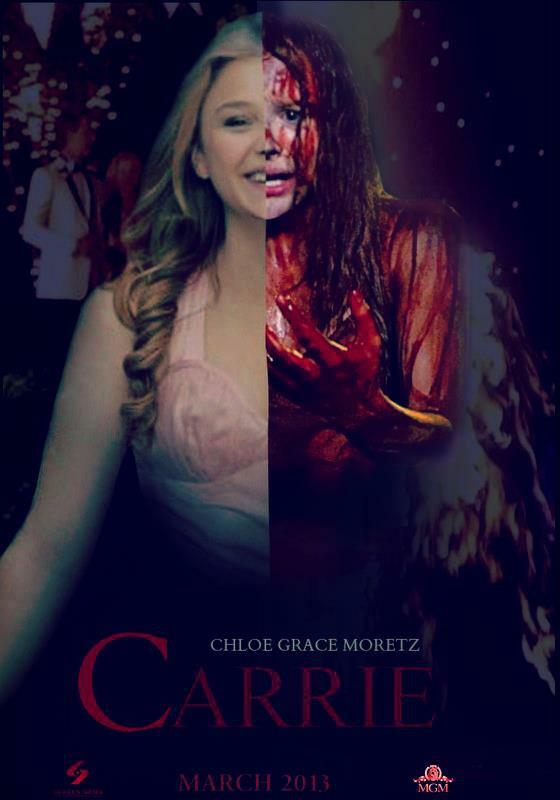 Chloe Grace Moretz plays a perfect 21st Century Carrie. She’s sweet, smart, and best of all — empowered. She sasses her religious fanatic mom Margaret White, played brilliantly by Julianne Moore, she’s on to her bully classmates questioning their motives and she grows as a person throughout the movie. Not to mention, she’s absolutely precious, so you truly feel sorry for all she deals with. A bully is always a bully, but in this modern version of Carrie they take it to the next tragic level of harassment with Smart Phone uploads. “Carrie” also illustrates the truth in that teachers are not always perfect, parents will often defend their little darlings no matter how wrong they are, and as annoying as text messaging is — there is tenderness in a few simple words, as we learn that Tommy Ross, played by Ansel Elgort is sincere in pursuing a friendship with Carrie by taking her to the prom (what you never really learned in the original, as you always second guessed — something I always hated about the original) and double kudos in showing via text message, even though Tommy Ross thinks Carrie is beautiful, he is still loyal to his girlfriend — a special sweet brief moment that makes the “good guys” (Carrie, Tommy and Sue Snell, played by Gabriella Wilde) all the more endearing. Oh, and there’s plenty of gore and blood — menstruation blood, blood from knife wounds and of course pig blood (but it’s noted that no animals were harmed during this motion picture). And of all the Carries, Chloe Grace Moretz does not go down without a fight — a big one … in fact, so big she’s almost Godzilla-like in the final scenes — as the audience cheers her on! Carrie is definitely an iconic hero in this flick. I highly recommend — especially to bullies because telekinesis is more common than you would think. So beware of who you pick on, there’s a little “Carrie” in all of us! Or at least there should be. Now you made me want to see it. & I really wasn’t too fond of them remaking this AGAIN because the original was a true classic. This made me think twice, though. As an often rejected girl in my whole scholarship, I can relate a lot to Carrie’s story. But unfortunately, I’ve never had any telekinesis powers ! And I didn’t know how to defend myself. Anyway, all that is over now. Today, I’m quite proud of what I’ve become. These people bullied me because I was different, I wasn’t fashionable, neither beautiful, nor “cool”, but, at least, unlike most of them, I was not (and I am not) a stupid brainless sheep as they could be. Carrie is a great movie and a great tale about bullying and how being mean to someone else can turn this person into a monster. Showing Carrie in classrooms could be a good thing to prevent school harassment, even if we sadly know bullyers nearly never admit they bully someone or always make good excuses to do so. I’ve just read your last article in which you deal with your intervention in front of students about that topic. I hope they all listenned to carefully and will apply what you said to them. Making prevention about bullying is a great thing : the more we talk about it, the less it’s a taboo and the more people realize how “uncool” it is too harass other people ! Ps : sorry for my late reply, I was in Scotland last week ! Of course they listened! People don’t give young people enough credit. And sister, you are preaching to the choir. As I said, I’m in the process of writing an anti-bullying book.